Making dumplings is a perfect activity for team building and a great way to spend time with large groups of friends. 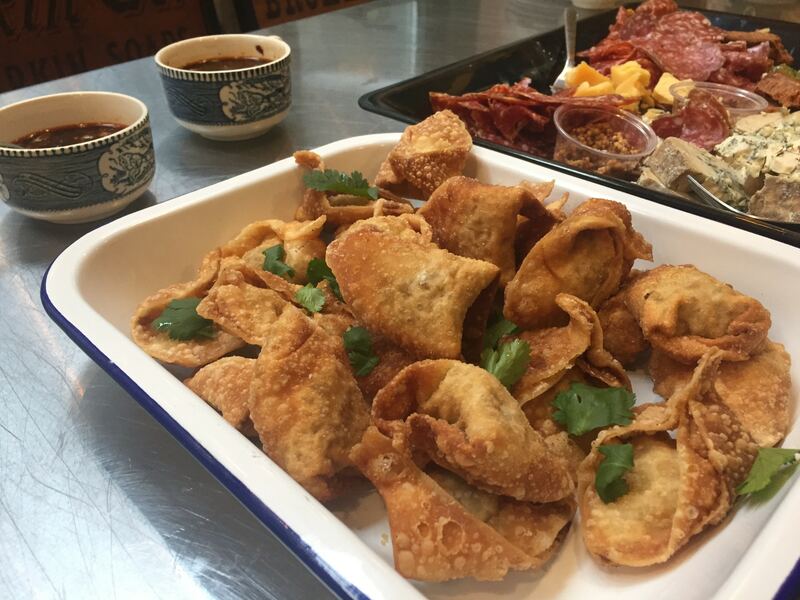 You all get to sit around a table sharing stories while mastering the art of stuffing and folding dumplings. Filled with cabbage for crunch, mushrooms for richness, and ginger for some zip, these vegatarian dumplings are packed with flavor. It’s important to make sure your oil is hot enough before placing your uncooked dumplings in the fryer. Too low of a temperature will result in a soggy unsatisfying outer skin, and too high of a temperature will burn the outside while under-cooking the inner filling. The trick to a perfectly golden and crunchy dumpling is to maintain a proper oil temperature and prevent overcrowding in the pan as you cook your dumplings. 1. Bring a large pot of salted water to a boil over high heat. Drop in the cabbage; cook for 3 minutes or until fork-tender. Use a slotted spoon to transfer the cabbage to the food processor; pulse until finely chopped. Empty the cabbage into a clean dish towel set into a large colander to drain. 2. Add the tofu to the cabbage. Twist the towel closed; holding it over the sink, squeeze as much moisture as possible out of the mixture, then open the towel and transfer the mixture to a mixing bowl. 3. Combine the mushrooms, onion, ginger and garlic in the food processor. Pulse until finely chopped, then add the mushroom mixture to the cabbage mixture along with the scallions, egg, salt, cornstarch, and sesame oil. Taste and adjust seasoning as necessary. 4. Place a baking sheet on the middle oven rack; preheat to 250 degrees. Line a separate baking sheet with a few layers of paper towels, then place a wire cooling rack on top. 5. Pour the oil into a heavy-bottomed pot or deep-fryer to a depth of 3 inches and place over high heat; using a candy or deep-fry thermometer, heat the oil to 375 degrees. Have the egg wash in a small bowl or ramekin nearby. 6. Working with one gyoza wrapper at a time (keep the others covered so they don’t dry out), place a generous teaspoon of filling at the center of the wrapper. Use your fingers to paint the egg wash halfway around the edge of each wrapper, then fold over to form a triangle, pinching the edges together firmly. Repeat to form 25 to 30 dumplings, using all of the filling. 7. Carefully add 8 or 10 dumplings to the hot oil; fry for 3 to 4 minutes or until golden brown, monitoring the oil temperature closely and adjusting the heat to make sure the dumplings fry at that constant temperature. Transfer them to the rack to drain, then transfer to the oven to keep warm. Continue with remaining batches of the dumplings. 8. Serve with Korean gochujang sauce for added flavor.